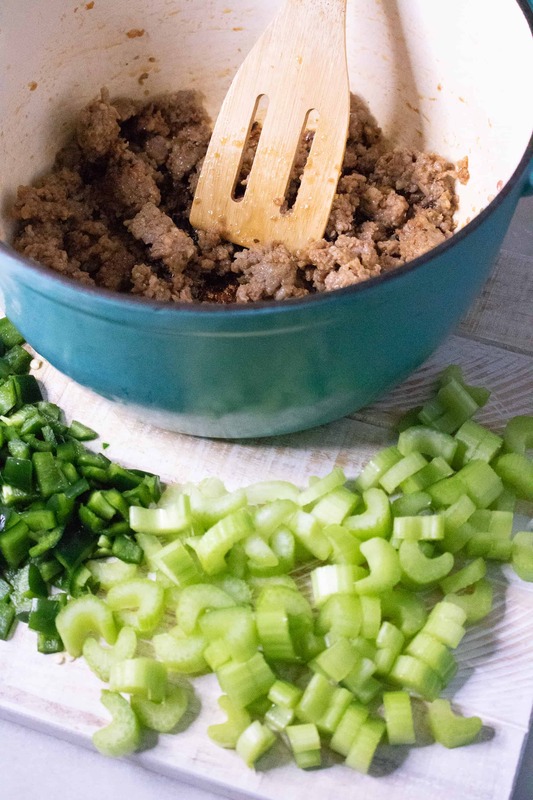 Say hello to your next favorite keto recipe! 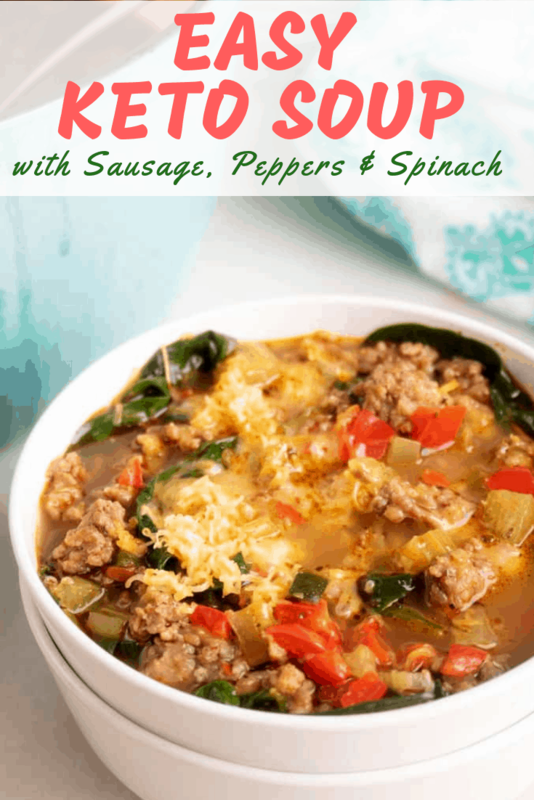 This Easy Keto Soup with Sausage, Peppers, and Spinach is ready in under an hour and is full of fantastic flavors. I don’t know about you, but I feel like there aren’t enough keto soup recipes out there. 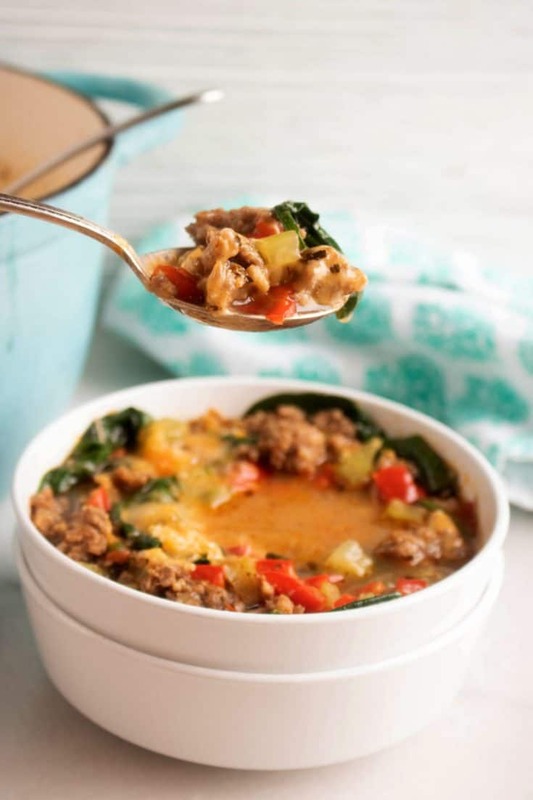 There are a lot of meat- and egg-heavy keto recipes, and a good number of veggie-heavy keto recipes, but I rarely see a keto soup recipe! The whole soup category just seems to be passed over in the keto world for some reason. I’m going to change that with this post! 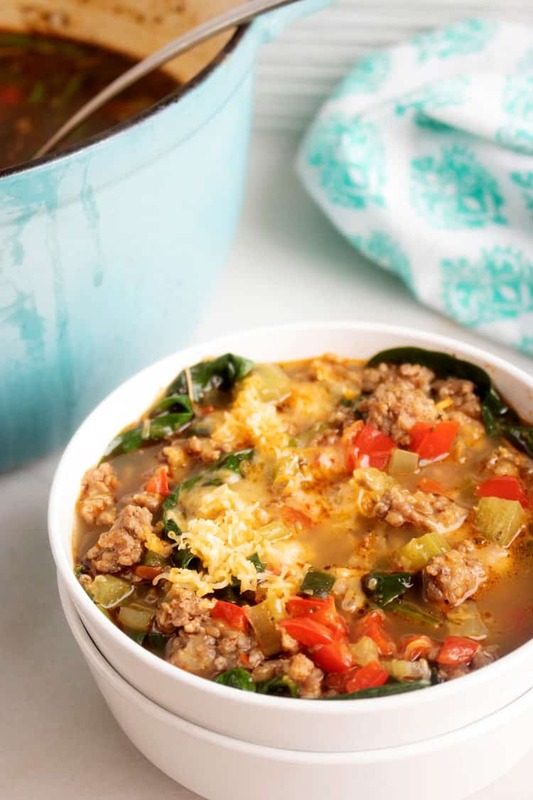 Easy Keto Soup with Sausage, Peppers, and Spinach is super low in carbs and high in fat and tastes so good. The keto (ketogenic) diet is a low-carb, high-fat diet. It lowers blood sugar and insulin levels so that the body begins to burn fat and ketones as fuel instead of carbohydrates. For those interested in learning more, there is a great deal of information about the keto diet along with many helpful resources that are readily available online. Reason #1: Soup helps you eat more vegetables. Eating more soup just might be the easiest way to increase your daily vegetable servings. Depending on the recipe, one bowl of soup can contain several servings of veggies, making it a truly nutrient-dense meal. Reason #2: Soup can help you lose weight. A bowl of Easy Keto soup packs minimal calories but is very nutritious. So it may be smart to include regularly eating soup as part of a weight-loss and exercise program. Reason #3: Soup makes you feel full. Soup fills you up because the water content and the food nutrients in soup are homogenized and remain in your stomach longer. This activates your satiety signals faster, so you will feel fuller sooner and stay satiated longer. Don’t you love it when a recipe tastes even better the next day? Some foods taste best fresh out of the pot or the oven, but others take time to hit their peak flavor. 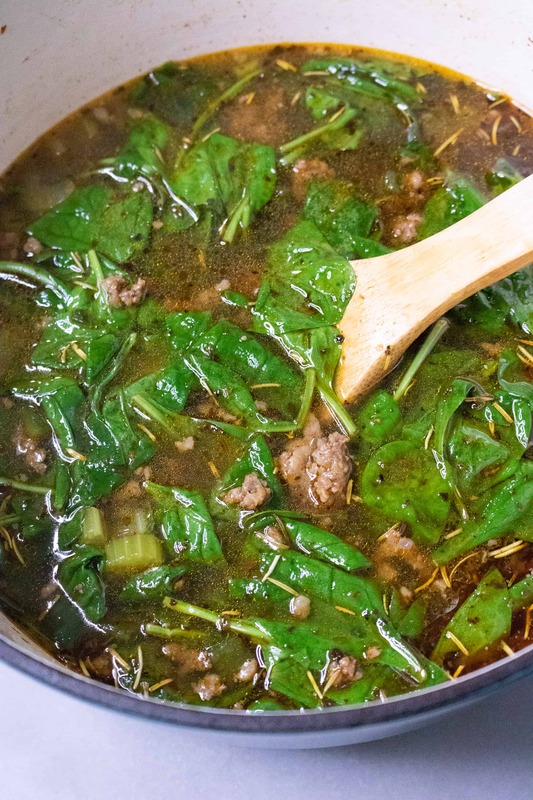 With this keto soup, the flavors have a chance to really come together and intensify on day two and beyond, making it a great leftovers soup or a great make-ahead soup. I love this soup as an easy meal prep solution. 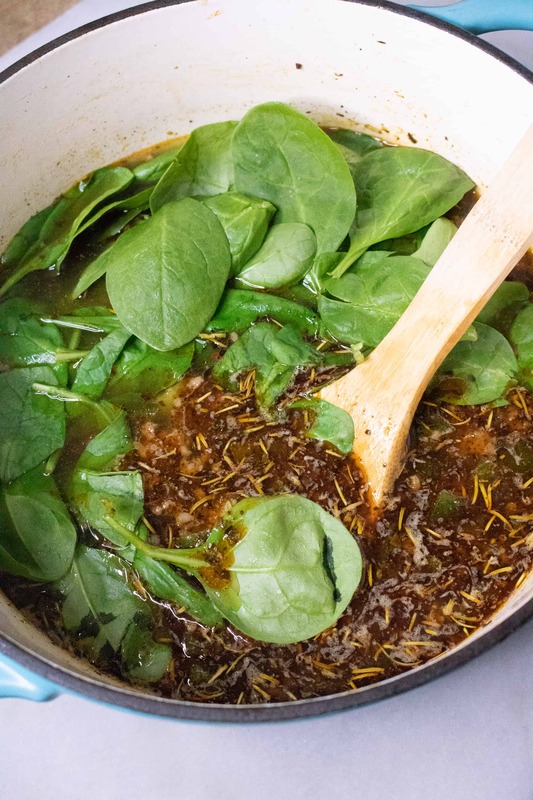 Whip up a big pot of it (feel free to double or triple the ingredients!) and then store the batch in the fridge. Or, you can also portion it out into individual servings using microwave-safe containers like these. That way you can quickly reheat your keto-approved meal as needed. Meal prep is such an important part of successfully staying on the keto diet (or any healthy diet in general), and soups like this make meal prep so easy! Step #1: In a Dutch oven or large soup pot, heat olive oil over medium-high heat. Add sausage. Cook for approximately 5 minutes, stirring occasionally, until the sausage is no longer pink inside. 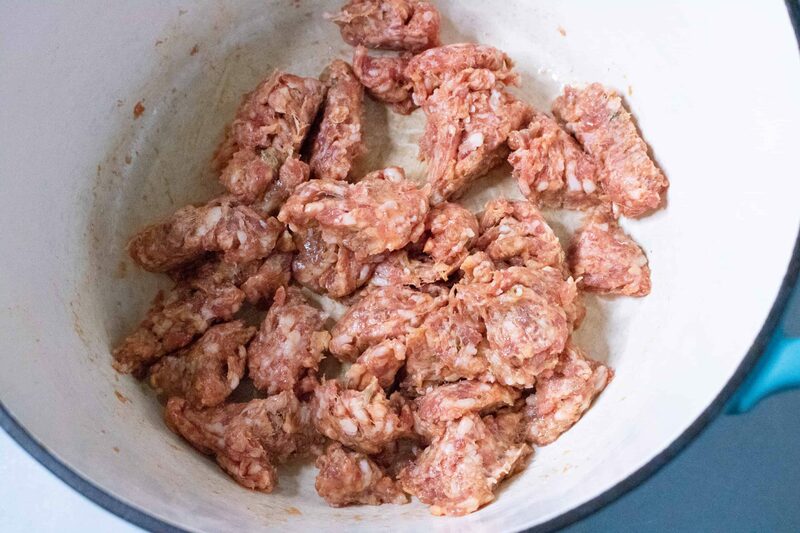 Break up the sausage into small pieces with a wooden spoon as it cooks. 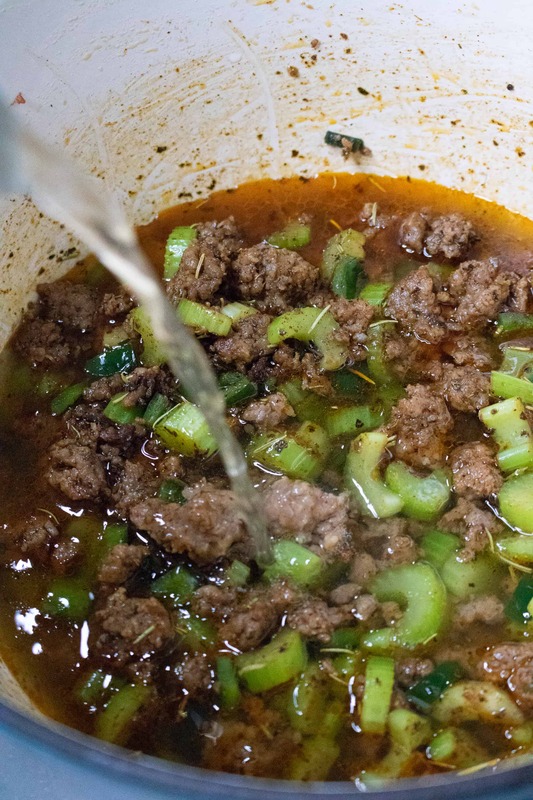 Step #2: Add the peppers (red and Poblano), celery, oregano, basil, rosemary, chili powder, cumin, and cinnamon into the pot. Season with salt and pepper to taste, and then stir to combine. Cook while stirring occasionally until the vegetables have softened (about 5-6 minutes). Step #3: Add chicken stock. Simmer for 20 minutes while stirring occasionally. Next add spinach and cook until the spinach wilts (about 4-5 minutes). Remove from heat. To serve: Top Easy Keto Soup with cheese, and, if you’d like, additional diced Poblano peppers. Easy Weeknight Keto Pizza with Pepperoni: Serve Easy Keto Soup as an appetizer before you eat keto pizza! Broccoli Keto Slaw Recipe: Serve Broccoli Keto Slaw alongside Easy Keto Soup for a light and healthy lunch. How Many Servings are in Easy Keto Soup? There are six servings in this recipe. This is a very easy recipe to double or triple! How Many Carbs are in Easy Keto Soup? 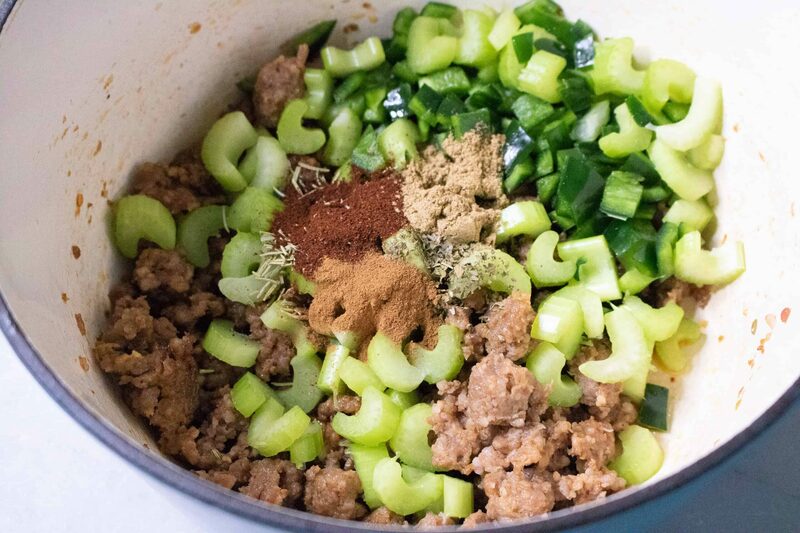 This easy keto soup recipe is very low in carbs. Each serving contains only 3.5 grams of carbs… 1.6 grams of which is fiber. That gives each serving of soup a net carb count of only 1.9 grams. Instant Pot Grain-Free Keto Cheesecake is so rich and creamy, you’d never guess that it is sugar-free and grain-free! Keto Wedge Salad with Homemade Blue Cheese Dressing perfect on its own for a satisfying lunch or paired with a delectable steak for a hearty dinner. Keto Loaded Baked Avocado Eggs are an amazing power-packed breakfast. 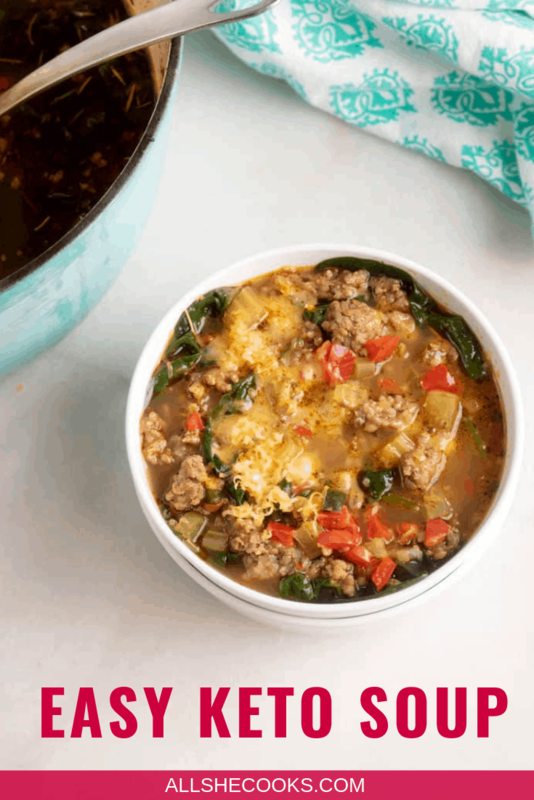 You will love this flavorful and easy keto soup recipe! The cumin in this was aggressive and overwhelming. If you make this, I’d highly recommend cutting back on the cumin. Other than that, it’s a great soup. It definitely depends on your palette. We enjoyed the cumin. Truly fantastic!! I’ve made this several times now. We all love it! I loved every bite of this soup!! I substituted 1 lb of Chicken & 1/2 lb of ground beef for the Sausage. Other than that I followed the recipe exactly. Just delicious!! Thank you for sharing! I will make again & again! I’m sure it could be. I’d start with sauteing the sausage and peppers and then probably 8 minutes on high pressure with a quick release. I made this soup exactly how the recipe said, and it was delicious! The flavours with the spices are soooo good! It was very easy and quick to make, and I’ll definitely be making more! Thanks for sharing! Delish! … I also added a chopped onion to the soup and kept the cinnamon in the recipe. So good, Oddly enough. This is really good. I added 4 ounces of cream cheese but otherwise followed the recipe. Delicious! I will make this again. just starting Kato. Love soups, will try.Trying to stay on track. This recipe has been a weekly staple in our household for a few months now. We absolutely love it! It’s even better the next day (if there’s any left over, that is). Made it with chicken breast and add zucchini, it was delicious.